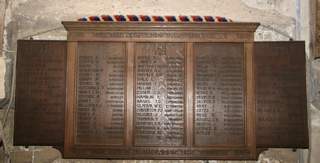 A wooden plaque naming members of the Winchester Diocesan Guild of Bell Ringers, who died in both World Wars of the 20th Century. This is included because it names three (out of five) men from the Isle of Wight, known to have died, who were members. DENNIS F. GODSHILL Believed to be Harry Stuart Denness, but not confirmed. Another document names Frederick Dennis, but research has not found a war casualty of this name. Thanks to Alan Regin for the photograph and other information on Winchester Bell Ringers recorded by the Central Council of Church Bell Ringers.